Australian airline Qantas will continue to face challenging times in the short-term, due to the weakening Australian economic and aviation markets, but new alliances may prove strategically sound, according to the latest research from aviation intelligence firm OAG. OAG’s Frequency & Capacity Trend Statistics (Facts) report for January 2014 shows the state of the Australian domestic and international markets. In December 2013, Qantas issued an unexpected profit warning and announced 1,000 planned job cuts, citing tougher competition and a reduction in demand as the main reasons. According to OAG, the changing Australian aviation market provides a difficult platform from which Qantas can regain a market lead. John Grant, executive vice president, OAG, says: “Over the past decade Australia’s economy has weathered the global economic storm, thanks to China’s demand for Australia’s natural resources. “However, the economic slowdown in China has led to a reduced demand for commodities, which has pushed prices down, affecting the Australian economy as a whole. Australia’s domestic market has seen significant consolidation from 26 domestic carriers in 2008 to 16 carriers in January 2014. Qantas, including its subsidiary Jetstar, accounts for a majority of 61 per cent of the domestic market share. Virgin Australia, including Tiger Australia, has moved away from the low-cost carrier (LCC) model, positioning Virgin Australia in direct competition with Qantas. LCCs now account for 27 per cent of Australian domestic seat capacity, down from 55 per cent of all seats in January 2011. 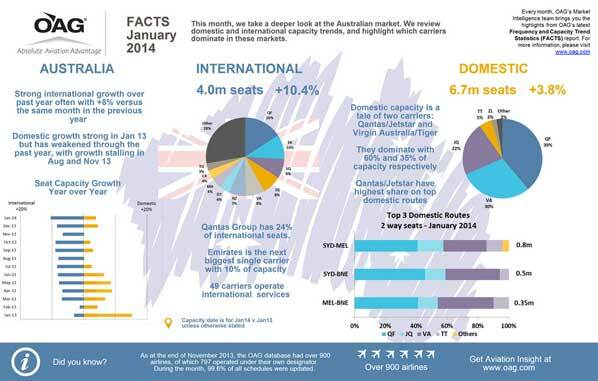 At present, Virgin Australia accounts for a further 35 per cent of the domestic market. In the international market there has been far less consolidation. There are 49 carriers offering international capacity to/from Australia, compared to 54 in January 2011 and 47 in January 2008. The top four international carriers provide 42 per cent of the total seat capacity: Qantas (16 per cent), Emirates (ten per cent), Singapore Airlines (eight per cent) and Jetstar (eight per cent). Despite a market lead, Qantas’s international capacity has remained flat over the last five years. In comparison, Emirates has almost doubled in size (up 98 per cent), partly due to their partnership with Qantas, with increases for Virgin Australia (up 84 per cent), Jetstar (up 60 per cent), Singapore Airlines (up eight per cent), and Air New Zealand (up seven per cent). The international LCC share is much lower than domestic at just 15 per cent of seats. LCC AirAsiaX’s seat capacity has grown rapidly in the last five years (up 287 per cent). This very rapid growth and success across the region suggests the share of Australia’s international seats accounted for by LCCs is likely to increase. Qantas’s share of the Australia-Asia market has fallen this January compared with January 2013, down from 14 per cent to 11 per cent. Qantas does not serve China’s southern hub but China Southern retains a 21 per cent market share, flying to Sydney, Brisbane, Perth and Melbourne. Grant continues: “Although the outlook seems challenging for Qantas at the start of 2014, its new relationships with Emirates and China Southern may prove to be strategically sound moves and provide a much needed shake-up of the Qantas-Asia network.